Rajasthan RSMSSB Udyog Prasar Adhikari Recruitment 2018:- Rajasthan Udyog Prasar Adhikari Vacancy Notification Download, RSMSSB Rajasthan Udyog Prasar Adhikari Application Form Apply Online Start & Last Date at http://www.rsmssb.rajasthan.gov.in. Rajasthan Subordinate and Ministerial Services Selection Board (RSMSSB) has announced & released the recruitment for Rajasthan Udyog Prasar Adhikari Vacancy 2018 Notification on 13th March 2018. The official is going to start online application process from a few days. Candidates will have to fought for 97 vacancies of Industry Propaganda Officer, Industry Observer, Financial Investigator, Hand loom Inspector, Salts Inspector. 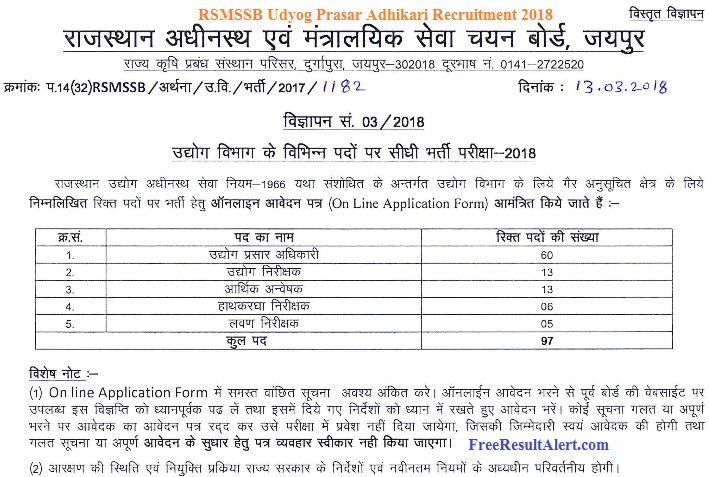 The RSMSSB Udyog Prasar Adhikari Recruitment 2018 is released publicly for students. 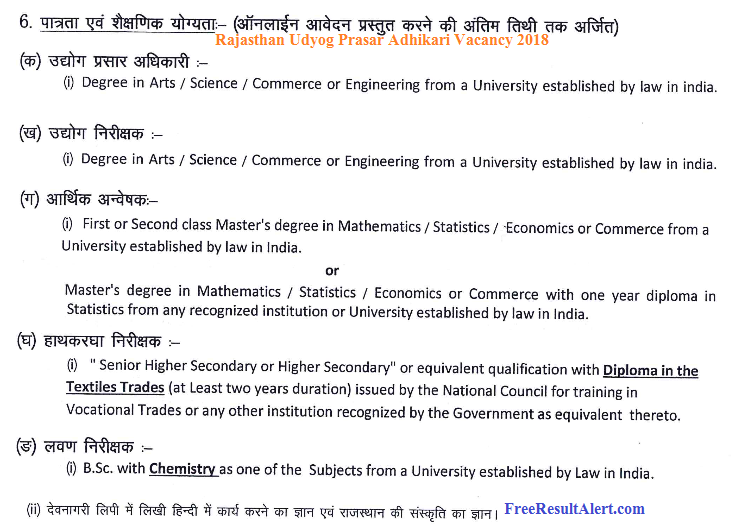 Candidates can check Rajasthan Udyog Prasar Adhikari Notification. Read all the details like RSMSSSB Vacancy 2018 for Udyog Prasar Adhikari, Eligibility and fill its Online Rajasthan Udyog Prasar Adhikari Application Form today. The online RSMSSB Application Form are going to start from 22nd March 2018. All posts under RSMSSB Udyog Prasar Adhikari Recruitment 2018 has different criteria to select. So candidates don’t get confuse among this. We will tell you all separately. ✿ Age Limit :- It must be between 18 to 40 years. Industry observer/Industry Propaganda Officer: Candidate must have a degree in Arts/ Science/ Commerce or Engineering from a University established by law in India. Financial Investigator: Master degree of 1st or 2nd class in Mathematics/ Statistics/ Economics or commerce from a recognized University. Handloom Inspector: Participant must have 10+2 or Higher Secondary or equivalent qualification with diploma in the textiles trades for two years duration issued by the National Council for training in vocational trades or any other recognized institution. Salts Inspector: Applicant must be B.Sc in Chemistry as one of the subjects from a University established Indian govt. Candidate must have a knowledge of Hindi written in Devanagari script. Those who are going to fill RSMSSB Udyog Prasar Adhikari Application Form 2018 will have to submit the recruitment fee online. It will be done using net banking or cards. For submitting the applocation form make sure that all the details provided are completely correct. Otherwise board will reject your application form. ➣ General/OBC/ SBC category :- 450/- Rs. ➣ OBC/ SBC (Non-Creamy Layer) :- 350/- Rs . ➣ SC/ST :- 250/- Rs. Note – If you have any query / suggestion of the Rajasthan RSMSSB 2018 Recruitment Notification for Udyog Prasar Adhikari. निचे कमेंट करें हमारी टीम आपकी सहायता करेगी !! First of all go to official link www.rsmssb.rajasthan.gov.in. Check the Advertisement Recruitment Section. There, Find & Select the Rajasthan RSMSSB Udyog Prasar Adhikari Recruitment 2018 Apply Link. Then, A PDF File will starts Downloading to your storage device. Finally !! Open & Read the Complete Rajasthan Udyog Prasar Adhikari Recuritment 2018 complete. Jo Syllabus RAS ka Hai Almost usi K Equal hai..